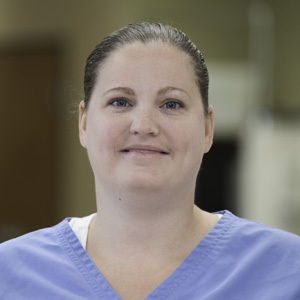 Michelle graduated from Michigan State University in 2007 with a degree in Veterinary Technology, and received her LVT certification that same year. She had worked in a general small animal practice for over 6 years, but was looking for something more challenging. Michele found emergency medicine to be a great fit! She did emergency for just over a year before joining AEC's ER staff in early 2014. "I enjoy the one on one time I get with my patients during the late night or early morning hours. I enjoy the excitement of emergency medicine and never knowing what will walk in the door next." Michelle has 2 cats: Cat and Mallow, and 2 dogs: Kenshin and Ziva. On her off days she enjoys volunteering at Day Dream Farms, a horse rescue that helps save and rehabilitate severely neglected and abused horses (and one day will be able to help rehabilitate people with PTSD and other related illnesses).